Nestled in the hills of Montgomeryshire lies a gem of medieval history, the enigmatic Ty Mawr hall (Ball 2009a) rediscovered in the late 20th century, yet over 500 years old. Hidden within a tumbled down brick cow house this remarkable medieval house was the largest aisled hall ever recorded in Wales, a teetering ruin on the point of collapse when first recorded in 1971. Today the restored building serves as a home on the Powis estate and the centre of History Matters, a unique living history museum that aims to bring the sights and sounds of the medieval age to life. In 2001, a volume of the Montgomeryshire Collections was devoted to a detailed description of the discovery and the research programme that was carried out on the building (Britnell 2001). The initial surveys of the site showed how close to total collapse the remaining timber frame was, it having started to rake down the slope. Initial conservation work saw the insertion of a scaffolding support frame and a new corrugated metal roof to protect the remains of the building from the elements. There then followed a debate that lasted over 20 years as to what was the best method for conserving the building. Suggestions included the encasement of the frame in a large Perspex box, dismantling and reconstruction at St Fagan’s museum, conversion into holiday cottages, or removal to Welshpool as the basis for a proposed arts centre. However what did emerge from the debate was the importance of conserving the building in its original location, where the medieval builders had chosen to site it, so that it remained part of the historic landscape. The house stands on a platform, created by cutting into the hill slope and depositing the spoil on the downhill site. However, this was not the first building on the site: excavation has revealed drainage gullies which outline an earlier building about half the size of the present structure. The large steep slope of the hill to the North of the building provides vital shelter from the worst of the winter winds and the southern aspect over the yard provides maximum light especially in the short days of winter. A spring line just above the house (long since dried up) provided a water source. It also sits alongside an ancient hollow way, the main route to nearby Welshpool in the past. Ty Mawr sits on the Powis estate, a few miles from Powis Castle. It was the current Lord Powis who agreed to the solution of having the building restored as a usable and tenanted house and home. Thus an agreement between the Powis estate and Cadw: Welsh Historic Monuments, saw the hall restored as a living, working building on its original medieval footprint, albeit with modern domestic facilities and internal layout. Subsequent recording, excavation and tree-ring dating have allowed a detailed history of the house to be reconstructed. The restoration was finished by 1998, along with an archaeological survey and a record of the existing frames. It is now a 'Scheduled Ancient Monument' and in 2000, the house was given the outstanding honour of the 'Building of the Year' award by the Royal Institute of Chartered Surveyors, beating the Sydney Opera house to first place (Southall Garner 2006). Ty Mawr in the township of Trefnant, Montgomeryshire was a house of quality, built and occupied by a family of wealth and distinction and is a rare surviving example of an important late medieval house typical of the Welsh Marches. It was built of timber felled in the spring of 1460 (Miles. 2001), just before Edward, Duke of York seized the crown from Henry VI. A year before the battle of Towton, the largest battle ever fought on English soil. The year the Earl of Warwick ordered Lord Grey to surrender Montgomery castle. We do not know if the owner fought in the battle, but he must have been a man of standing in the locality to have built a house called Ty Mawr (Great House) and he must have been aware of the power struggle between the nobles and magnates that we call the War of the Roses, which forms the political backdrop to its building. The site is close to the route that Henry Tudor (later Henry VII) took on his march across Wales in August 1485 to the battlefield of Bosworth where Richard III was slain. Ty Mawr measures 17.5 m long by 8 m wide. It was of five bays, with an unheated chamber at the upper end above the service rooms, a two-bay hall with an open end hearth at its centre, a cross-passage by which the site was entered and a lower bay where animals were stalled. The timber-framed building was aisled, with the exception of the base cruck truss which spans the centre of the hall. The fine quality of the timberwork and the cusped decoration suggests that Ty Mawr was an important house although, as yet, it has proved impossible to identify who actually built it. The most important feature at Ty Mawr is the spear truss which forms the entrance into the hall. The posts are carefully chamfered and stopped and the side panels have large quatrefoils as decoration. There may have been a moveable screen in the centre, matched by a canopy over the far, or dais end of the hall, where the head of the family would have sat. The position of the hearth is marked in the restoration by the brick paving in the floor. The smoke would have risen and percolated through what must have been, originally, a thatched roof; the original timbers are still smoke-blackened and the pitch of the roof trusses also suggest a thatched roof, possibly rush thatched as opposed to straw. There was little thatching straw grown in the area and thatching with rushes has long been the regional norm. On the opposite side of the cross passage is a staircase leading to a loft above the cow byre. Thus Ty Mawr is similar in form to the ‘long house’ with man and beast under one roof. The native landowners in the Marches were cattle men and measured their wealth in the number of livestock in their herd. Therefore they protected, nurtured and secured them within the building during the winter months. In about 1594, a replacement floor was inserted in the upper chamber and the hall. Not only did this continue the layout of two service rooms at first-floor level, it also expressed this period’s increased valuing of, and desire for, privacy. The work is of a good quality and the joists are neatly chamfered, yet these changes may also indicate a decline in status to a yeoman’s farmhouse. The hearth was moved to the upper end of the hall and the family would have gathered around it, rather than dined with their retinue and guests in the medieval open hall. 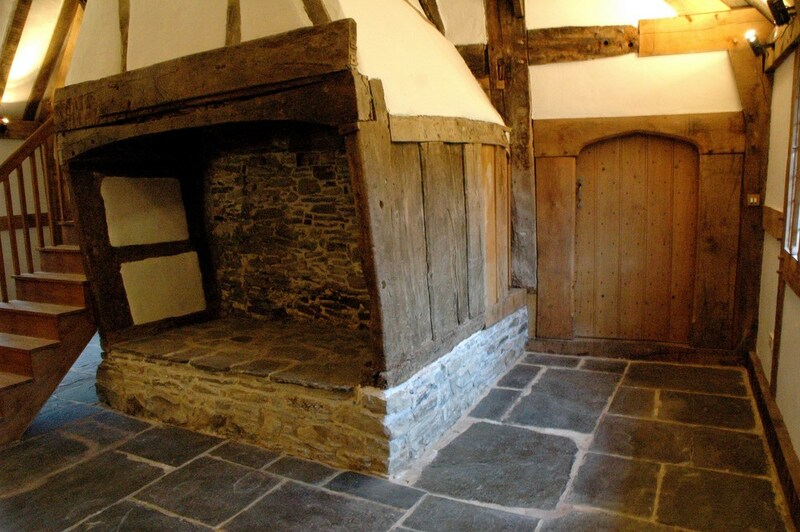 In 1631, the existing fireplace with its wattle-and-daub hood was built. Miraculously, this has survived for over 350 years. Soon after, the aisles were removed and certainly by the middle of the eighteenth century, the house was partly encased in brick. Some of these locally made handmade bricks can be seen in the reconstructed floor marking out where the original central hearth lay. A brick bread oven was constructed at the back of the fireplace; the original kitchen may have been a separate external building. Ty Mawr then remained a farmhouse until the nineteenth century. Modern partitions now subdivide the upper and lower bays. Ty Mawr’s extraordinary timber trusses – which have survived for over 550 years – form the centrepiece of the restoration work undertaken by the Powis Estate with grant aid from Cadw Welsh Historic Monuments. 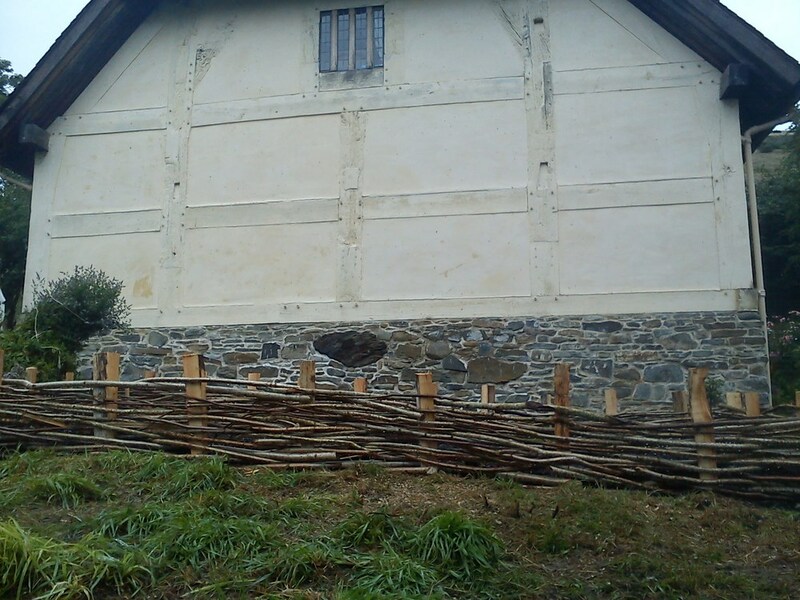 The building was rescued from imminent collapse and appears now much as it would have done in about 1635.However the restored form of the timber frame sits in the medieval footprint, with the full width of the aisles (7.5 m) as the structure would not have remained upright, being unable to resist the raking from the slope without the base crucks shedding the load from the roof down to the ground. Restored under the auspices of Cadw and the Powis estates in 1998 the house is now open for visitors during the summer months and has since 2009 been the ‘base’ for the community heritage organisation, ‘History Matters’. History Matters is a not for profit volunteer enterprise and community based heritage organisation. Based in Mid Wales, it interprets heritage sites to visitors and provides the resources to enhance and complement historical monuments and heritage events. We specialise in living history displays of the Middle Ages (1460–1485) and also promote, manage and develop projects at the award winning Ty Mawr medieval hall (built circa 1460). 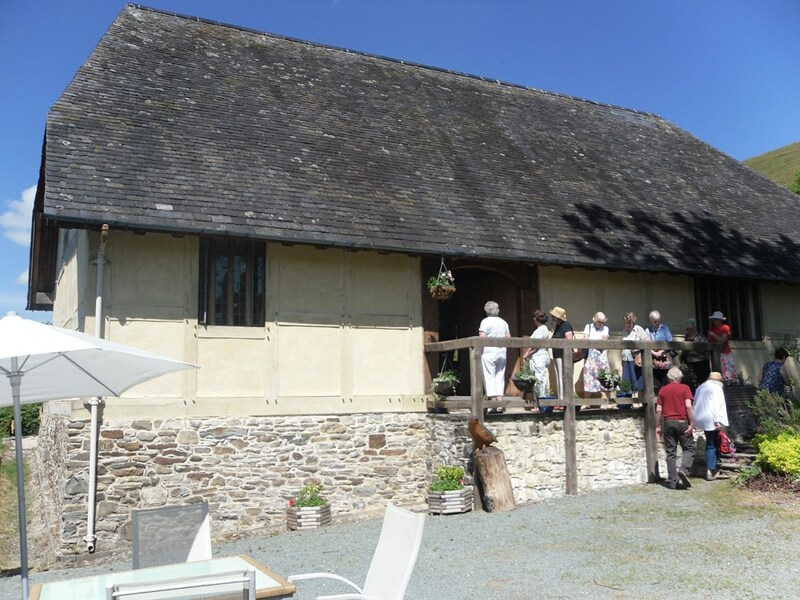 Clients range from community groups, private individuals and Local Government to Heritage Organisations including Cadw, the National Trust and English Heritage. Volunteering is central to our work and projects have involved members from a wide range of cultural, national and linguistic backgrounds. We also work with the UNA Exchange Wales providing projects for international volunteers. The ‘Live and Learn History Volunteers ‘(Ball 2010) project, grant aided by the Heritage Lottery Fund, has enabled a wider range of volunteers to engage and participate in the project. A core element of our work is the education department, based at Ty Mawr, where we are developing hands on resources for visiting schools. Some of our work is seen as experiential archaeology, some as historical education and some as entertainment or a mix of all three. As members of EXARC we strive to incorporate the view that the past should be explored not only through destruction (excavation) but also through creation (Experiments and experiences) (Ball 2009b). A key, core element to the Open Days has been the living history re-enactments provided by the Wars of the Roses Federation groups and local re-enactors, which have supported the events throughout the summer. ‘History Matters’ is working with some excellent groups who bring the skills and dedication required to bring history to life and are often seen at larger heritage events ,such as English Heritage’s ‘History in Action’. We have firmly associated Ty Mawr with re-enactment in the area and have received recognition for the quality of the events and the standards of the participants from visitors and peers alike. Having a number of different groups involved has surprised many return visitors who are impressed by the variety of displays from event to event. The successful living history ‘theme’ formats, have included a crafts weekend, an archery tournament and the battle of Bosworth and Death of Richard III event in August each year. This seasons demonstrations focus on traditional building skills. Reproduction medieval buildings are constructed as part of the displays, using the tools and techniques of the 15th Century. History Matters also attended other heritage events elsewhere and has also participated in a number of the major heritage weekend events across the UK. All members of History Matters and the many participants volunteer their time to support and aid the projects. From cutting the grass, sitting on the management committee, selling tickets to displaying a medieval craft, these are some of the examples of essential time and resources that are given freely to the project. An International element of volunteering is provided by the UNA Exchange Wales who promote work opportunities at heritage projects, such as ours, worldwide. It provided the team that completed the first ground works and built the medieval Bread Oven in August 2009. We had more opportunities to work with the UNA Exchange volunteers again during 2013 as we hosted two projects at Ty Mawr, continuing the construction of the medieval buildings and giving practical hands on insight into this growing and fascinating facet of heritage interpretation. The International Volunteers learnt about medieval life and soldiering during the Wars of the Roses. They trained at a medieval encampment at Ty Mawr and then participated in the Open Days there, while also joining re-enactments of the battles of Bosworth and Mortimer’s Cross. 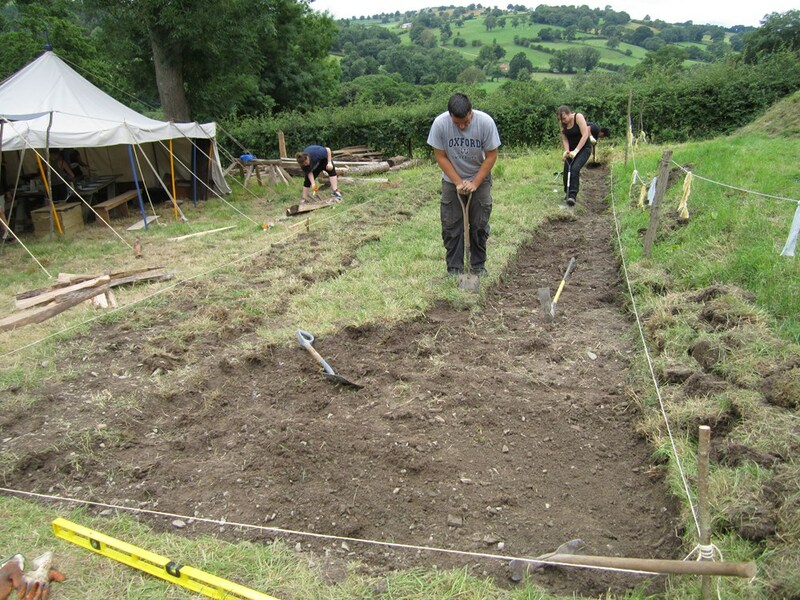 They also helped with site development, constructing a new access track to the car park, levelling new ground, digging terraces and rebuilding traditional wattle raised beds for the medieval garden at Ty Mawr. It is a real ‘hands on’ experience of historical interpretation in an open air museum setting and has encouraged participants to pursue these newly acquired skills back home and seek out similar projects in France, Italy, Turkey and Serbia. The project is always keen to hear from potential volunteers. Full training and equipment is provided. We are developing a ‘Friends of Ty Mawr’ from the visitors to manage the volunteering elements of the Ty Mawr project and to provide fundraising and social events for its members. BALL. G (2009a). TY Mawr - Great House. Last accessed 26th November 2013. BALL.G. (2009b). Living in the past to learn for the future. BALL.G. (2010). Live and Learn History Volunteers. RCAHW. (3rd October 2007). Ty-Mawr Hall House, Castle Caereinion. Southall Garner. (2006). RICS Building of the Year 2000. Fig 2. 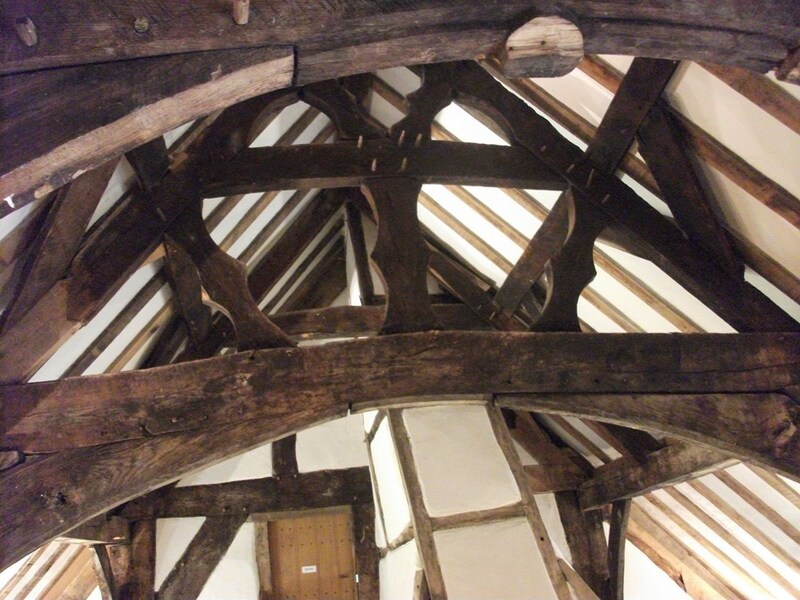 Central cruck truss circa 1460. Fig 3. Timber smoke hood circa 1635.